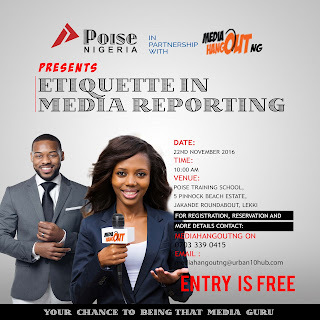 Etiquette Training: Poise Nigeria plans to trains 30 media personalities in Partnership with The Mediahangoutng. In recent times, Nigerian media personalities are called upon by NGO’s, International brands and foreign parastatals to cover and monitor major events, like the upcoming US election which Channels TV political correspondent, Seun Okinbaloye has been elected to be part of the group of Senior Foreign Journalists and fellows covering the event. With this there is a need for media practitioners to undergo training on general etiquette and media etiquette which will help enhance their cross cultural sensitivity and professionalism. According to Mrs Mavi Isibor, the Group C.E.O of Poise Group, Etiquette will help professionals in the media industry reflect confidence, build inter-personal skills, strong relationships and prevent misgivings with important stakeholders. As Nigeria’s No 1 etiquette school we have taken this upon ourselves by partnering with Mediahangoutng to train for free as part of our corporate Social Responsibility. Miss Rosemary Egabor also stated that partnering with Poise Nigeria is part of Mediahangoutng’s commitment to build a stronger media industry that is respected locally and internationally through training which is one of its key pillars.